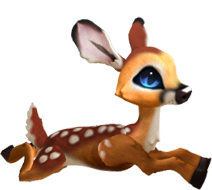 Fawns themselves are NOT free to purchase, but after you acquire yourself a breeding pair - you can breed them for free! Fawns are transferable which means everyone is allowed to buy and sell them on the secondary market. Please attend Auctions and browse around Markets to see what other users in the community are currently valuing various Fawns at. Not a big fan of breeding? That's fine! You can purchase a "Stay Forever Potion" for L$295 to enjoy your Fawn in-world forever. Mind you - Fawns can be bred completely for free, so we highly recommend at least giving breeding a chance. All Fawns are wearable! Try attaching one to "Avatar Center" to have it run along-side you, or attach one to "Right Hand" to wrap your arms around them.